First Kana Kandein, then Ayanand Ko. 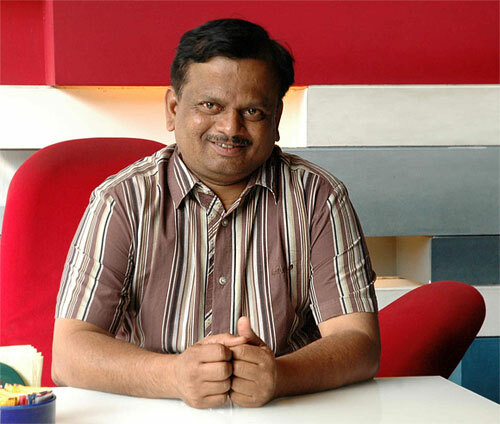 Cinematographer turned film-maker, K V Anand, is back with another directorial venture, Maattrraan. The last two films he directed were huge box office successes, so his teaming up with Suriya once again after Ayan has made Maattrraan extremely hot in the market. So has the story, on conjoined twins. As the film gets ready to reach the theatres on October 12, K V Anand talks about the making of Maattrraan. Your last two films Ayan and Ko were very different from your first film Kana Kandein, which was more realistic. Did you deliberately change paths? I would say all the three films had solid stories. In Kana Kandein I spoke about a social issue like water. In Ayan it was smuggling and in Ko, it was about the media. This time, I am talking about conjoined twins. So, if you take the story out, all the three films are the same. But you have treated them differently in the sense that you have made these films bigger and more commercial. I don't know when that will happen. When I made Kana Kandein, all the critics liked the film but the film did only average business. Nobody complained that he lost any money but nobody made big money. For Ayan, I was working with Suriya and the producers were AVM. Naturally, the budget increased. Same was the case with Ko. Even today, many multiplex city audiences come and tell me that they liked Kana Kandein better than Ayan and Ko. But if you go to rural areas, you will see that the audiences laughed and appreciated Vivek's comedy more than the treatment or the theme of Kana Kandein. I didn't plan for things to evolve like this. This is the film industry; you are a big director one day and when your film flops, you are nobody. Every six months, the equation changes. And even your friends will forget you when you are nobody. I can honestly say that I have done what I wanted to do in all my films. Is Maattrraan bigger than all your earlier films? Yes, concept-wise and script-wise, it is much bigger than all my earlier films. According to me, it is more difficult to make a big budget film. Forget about shooting it, a big budget film has to cater to all sections of people. A small budget can be made for a specific audience but here, you can't do that. For a big budget film to recover money, it has to run all over the state and has to be liked by all. Is that not a tough task? Yes, it is. That is why the directors of big films get both compliments and brickbats. The educated class and the critic may say it is a class movie except for the silly comedy. Again, the silly comedies are not for the critics; it's for some other people. A good entertainer is one that has the right mix for everyone but the problem is, no one knows what the right ingredients are. Nobody knows which film will click with the audience. That is the uncertainty of cinema. Just two days for the release of my film, and I am feeling extremely tense. I have butterflies in my stomach. From where did you get the inspiration for Maattrraan? Shankar and I were returning from Spain after shooting a song for Sivaji. It was a nine-hour flight and I happened to read a story about the Thai conjoined twins, the Bunker brothers, Chang and Eng, in an issue of National Geographic. They lived from 1811 to 1874. They were bought by an American circus company when they were five years old and they travelled all over the world with the circus. When they were 28, they bought a farm and settled down in the US. They married twins and had 21 children and many grandchildren. That was the first time I was reading about conjoined twins. Back in Chennai, I met Suriya and told him a story about conjoined twins. The story had nothing to do with Chang and Eng but they were the inspiration. What was more interesting to me was there was no privacy between these two individuals; they had to do everything in life together. At that time, I had already directed my first film. But then you went on to make Ayan with Suriya... Why? Suriya liked the idea and asked me, when are we going to make it? I also was not sure. It was not a double ro#8804 it was about two Suriyas joined together. I was not confident about the computer graphics then. So, I decided to make Ayan. After Ayan, Suriya went on to act in Aadhavan and 7 Aum Arivu and I made Ko. When I was finishing Ko, one fine day Suriya calls me and asks, what has happened to the script about conjoined twins? When are we making it? If we don't make it now, it will not happen. Suddenly, I was also rejuvenated about the script. If Suriya had not called me that day, I don't think I would have made this film. That was how Maattrraan happened—because of Suriya's confidence in the script. (Smiles) Suriya and I respect each other a lot. I was the cinematographer of his first film. His first photo-shoot was also done by me. Having seen him as a shy young man working in a garments factory, I am surprised and happy to see his tremendous growth. He never wanted to be an actor and said no several times to Vasanth, his first director. He was very hesitant and not very confident at the photo shoot also. Later on, he chose good films with good directors and grew as an actor. Even today, he is willing to learn and is a fast learner; he looks at every film as his first film. Are you happy with the way the film has shaped up? I am! I feel Maattrraan will make the audience not only laugh but they will also come out of the theatre with moist eyes. It is the emotional journey of two people. Of course, there is action in the film. It is also an edge-of-the-seat thriller where we discuss some international issues. The film is two hours 48 minutes long, and at least for two hours I want the audience to forget that they are sitting in a theatre. If I succeed in that, the film will be a huge success. Have you bid goodbye to cinematography? Not at all. When I run out of scripts, I will do cinematography. The day Ko released, I started discussions with SuBa on Maattrraan. Now, my next script is also ready but I will start the film only by March or April. So, I will have some breathing space.